The fast and easy way to clean light soiling and add significant protection! Your boat is in a constant battle with its environment. Salt-spray, sun light, and water are constantly attacking your finish. This is why Marine 31 Gel Coat Wax & Shine Detail Spray is formulated with premium carnauba wax. Every time you use this spray you add substantial protection to your boat's finishes. Because spills and soiling can occur at any time, Marine 31 Gel Coat Wax & Shine Detail Spray is designed to work in direct sunlight! Marine 31 Gel Coat Wax & Shine Detail Spray, like the rest of the Marine 31 range, is designed to be harbor-safe and eco-friendly. You can use Marine 31 Gel Coat Wax & Shine Detail Spray as often as you like on any exterior surface of your boat. Help keep your boat and the environment clean with Marine 31 Gel Coat Wax & Shine Detail Spray! Working one section at a time, spray a fine mist of product directly onto surface and wipe clean with a microfiber towel. Flip the microfiber towel to a dry side and lightly buff the area. Change to a fresh towel as needed. Repeat steps 1-3 until entire boat is cleaned. To further increase the gloss, slickness and protection, apply a quick coat of Marine 31 Gel Coat Spray Wax Plus. A Tip From The Captain's Chair: Keep a bottle of Gel Coat Wax & Shine Detail Spray handy to clean the common messes that occur during boating or to remove light dust if you boat has been sitting. 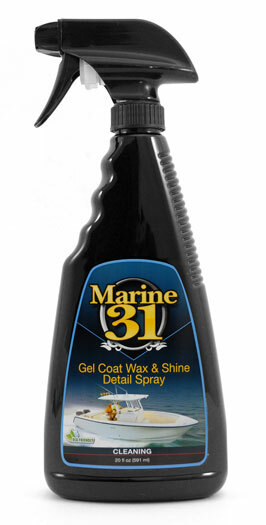 For more shine and protection apply a quick coat of Marine 31 Gel Coat Spray Wax Plus!